Yelm Prairie, with the assistance of the Nisqually river and the natural geography of the land is being put on the map as one of the most important irrigation centers in the state of Washington. Irrigation of the Prairie has been realized after years of struggle and the entire district is beginning to prosper. The hardships which the hard-working farmers of this section will not soon be forgotten. The Yelm irrigation project is complete and the ditches are running with water. The extension of the benefits of irrigation from the same project to the other lands yet to be developed to their full capacity undoubtedly will be undertaken. A few years ago the Yelm Prairie was a howling wilderness of dirty prairie grass that died out every summer during the dry months. Yelm was for many years a picture of distress, a little group of weather-beaten, dust colored, stores and houses resembling a tank town in the sage brush more than a thriving farming community. A few days ago a woman who lived during her childhood days on the Yelm Prairie returned to see how the old home looked. She found the fields growing fine, the irrigation ditches carrying prosperity to the farmers and automobiles gliding over the roads where teams in the old days struggled to pull lightly laden farm wagons. She returned to her home in the city praising the old Yelm Prairie as she had never praised it before. J.L. Mossman is one of the Yelm citizens responsible for the improvement. Years ago he conceived the idea of irrigating the prairie. Mossman conducts a general store and is one of the kind of citizens who cannot let things go haphazard. Twenty years ago Mossman made an investigation at his own expense to determine whether or not the district could be irrigated profitably. He spent much of his time and money on the scheme, but he was given little support. Some of the old timers laughed at him. Others refused to listen. Irrigation was there but little practiced it in the west. Mossman was told that if the prairie were watered the moisture would sink away and disappear. He was told by the farming experts of the community that the scheme would not work, that the soil was not good enough, that there wasn’t enough water in the world. But, about this time a certain irrigation ditch in the west was being constructed, and it was costing a lot of money. The backers of the project put in $75,000 and were forced to shut down. The best looking man in the outfit was dolled up in a $10 suit of clothes and sent back east to talk to a big railroad official. Result – the ditch was completed. The Yelm ditch, however was not built that way. Associated with Mossman were L. M. Rice, O. K. Thompson and Chester Thompson as well as J. P. Martin. All three served in different capacities while the big ditch from the Nisqually was being constructed. The work of surveying the ditch was a job of itself. The main idea was to spread the water from the river over the prairie as well as possible, but it had to be done systematically by following the highest lines and giving the ditches a fall of at least one foot in 1,00 feet. The valley is seven miles long and from two and a half to three miles wide, naturally drained through the center by Yelm Creek, it was necessary to take the water from the Nisqually river at a point 14 miles upstream and to convey it down to the prairie in a long flume. The flume was constructed on land as much as possible but in some places it hugs the side of the cliffs and hills and is more or less scenic. As the district develops tunnels probably will be constructed through some of the hills and the flumes made more permanent. It was hard scrabble, however to put the big project over, and now the ditch is complete with the exception of a few minor details and improvements will be undertaken from time to time. The prairie is divided into tracts and there will never be any shortage of water as the river is high at the time when the irrigation is the most necessary. Tacoma Times June 30, 1916. War correspondents, when the exigencies of war withhold their messages from the impatient world and the much more impatient editor, write picturesque stories of how they failed —and get away with it. No war correspondent was ever more absolutely muffled, silenced, bottled up, than I was when I tried to get the news from the great event on Yelm prairie to The Times yesterday afternoon. The great event was the opening of the initial unit of the Yelm Irrigation Project, which brings the waters of the Nisqually river to 6,000 acres of prairie land which much need the same. The farmers own the project themselves, from the intake four miles from La Grande to the little laterals which carry the water out on the fields. There are 14 miles of ditch, 9,000 feet of flume, and a siphon to carry the water under the railroad. It has cost them five years and a half of hard work, and $100,000, and they believe it will make Yelm and its neighborhood rich agricultural district. Naturally, they are pleased about it. So they invited everybody to come and see it; and pretty nearly everybody did come. A thousand people gathered at Rice’s Grove, near Yelm, for the exercises. Tacoma sent seven machines filled with members of the Commercial club and the Real Estate Men’s association, under the direction of A. E. Grafton, in the morning, and five more from the Rotary club in the afternoon. There were delegations from Olympia and Centralia; the villages of Yelm, Roy and McKenna and the whole surrounding neighborhood were depopulated. Depopulated is not a strong enough word; they were abandoned. That was the trouble, so far as the war correspondent was concerned. This story should have been in yesterday’s Times. That it wasn’t, is a proof of how much the irrigation project means to Yelm. Yelm was so busy celebrating the biggest event in its history, that it forgot to keep its telephone lines open. I was in P. F. Sloan’s little Reo, which was the pacemaker for the morning procession of machines from Tacoma over the blue and yellow prairies. We reached Yelm about 10 o’clock and were to start at once for a tour of the ditches. A reporter’s only excuse for existence Is to get the story into the paper. If it is impossible, you have to do it anyway. If you are killed, you must get the story in before yon die. So, —”Where can I get a telephone about noon?” I asked a prominent citizen of Yelm, who was dispatching the stream of automobiles down the road. townspeople of Yelm with respect; and the farmers looked at each other with the happy wonder of those who see dreams come true. Most significant of all were the salesmen who slipped quietly around through the crowd — salesmen for hay rakes, for silos, for plows, for all the things which everybody believes Yelm farmers are going to want in increasing numbers from now on. It was a genuinely great occasion. I glowed with satisfaction as the time drew near for me to put the story of it on the telephone. In fact, I was so anxious to do so that It was not yet noon when, as we passed a farmhouse to which a telephone wire was connected, I decided not to wait to reach the big white house near the grove. Mr. Sloan pulled up the Reo and I went in, welcomed heartily by the entire family, which stood in the yard waving at the passing autos. I gave two shorts and a long, and waited. Then I gave two more shorts and a long. Then I did it again. And in that instant, I knew I was a war correspondent and would have to fight to get my message out. Mr. Sloan grasped the situation. “Where do you want to try next?” he demanded, turning the Reo on its heels. “The big white farmhouse near the grove,” I said. And we went. It didn’t take long, but It was longer than I liked. It was almost noon. There was an ominously deserted look about the big white house as we drew near. The family had gone to the picnic. “There’s another house over there, with a telephone wire,” cried Mr. Sloan, who had been reconnoitering. That family, too, had gone to the picnic. I ran back to the Reo, looking at my watch as 1 ran. It was just noon. “Where now?” asked Mr. Sloan. I found It hard to answer, for we both knew that at just about that moment the crowd at the grove was beginning on the cold chicken. But a war correspondent has to ask others to share hardships occasionally. “Could you take me to Yelm?” I said. There are, I hope, no speed limits in the Yelm neighborhood. Anyway, we didn’t ask. Yelm has several buildings standing in two rows. The Reo skidded up to the first of these and I rushed into the open door. It was a hotel. “The telephone,” I gasped. The waitress looked mildly surprised. In the next two minutes I had verified her words. I tried every door on that main street, and one or two that were not on it. My story had by this time reached an importance in my own eyes, equal to the story of the capture of Villa. I simply had to get it in. It was outrageous, incredible, impossible, that I could not get a telephone. Yet it was true. Suddenly, I spied the red-painted depot on the other side of the railroad track. Telegraph! I ran for it. And just before I reached the track, a freight engine, dragging a string of cars as long as the irrigating ditch, intervened. I waited. I don’t know how I did it, but I did. And when it had passed, like a slow nightmare. I reached the station. The exercises at the grove were fine. P. J. Martin, president of the irrigation project, explained that it is of equal Importance to all lands in Southwestern Washington of similar character, and that they hoped to make Yelm the Petaluma of the Northwest. Gov. Lister praised the project and spoke of good roads. Peter Goven, of Sequim, and C. J. Lord of Olympia, also spoke. But I didn’t hear much they said. I was wondering if somebody else had found a way to get the story out of Yelm. Olympia, Saturday, Dec. 31 – The most pretentious irrigation scheme ever launched in Western Washington is assured in organization by Thurston County ranchers of a company with $50,000 paid up in capital to engage in irrigation of not less than 7,000 acres of prairie lands near Yelm and possible irrigation of about 37,000 acres of lands. The corporation has been formed and appropriation made of waters of the Nisqually River, sufficient to irrigate the maximum quantity of lands named. It was stated today by Fred Carlyon, one of the incorporators that the point at which the water will be diverted from the stream is twenty-five feet higher than any part of the prairie to be irrigated. There are seven surveyors now in the field under the direction of L. M. Rice and Co., of Seattle, the engineers who will have charge of construction of the canals and laterals. The plan provide generally for open ditches although in some instances flumes will be necessary to carry the waters across gulches and creeks. The soil of the prairies southeast of Olympia is said by government and state college experts, who recently examined it to be much similar in characteristics to that of the Spokane valley and most productive under irrigation. Still there were those who claimed that irrigation had retarded the town’s growth and would eventually lead to its ruination. 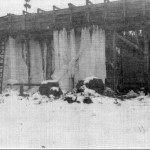 They told of waiting helplessly, watching crops dry up, while broken flumes were being repaired. They told of makeshift flumes and rocky ditches in which water drained away before it reached the fields. They complained of assessments they were forced to pay or lose their land – assessments which were exorbitant when you considered that the supply of water was seldom adequate and never certain. They told of families who had lost their land and moved away, leaving fields to grow up to grass and weeds. Statistics verified their charges: Assessments were $10 an acre on irrigable land and $1.50 on acre on non-irrigable lands within the district. According to figures for January 1948, 439 acres – 10 percent of all first class land – had been taken over by the district for non-payment of assessments. No new families were moving in. Banks refused to lend money. Of the 4,350 acres within the district suited to irrigation, only 30 percent was being farmed. Year after year, Yelm Irrigation Co. had run more deeply into debt. In 1933 it had been reorganized. The state had taken over its debts and paid off bonds and warrants at 33-1/3 cents on the dollar. Throughout the middle thirties, it had been subsidized by the WPA. 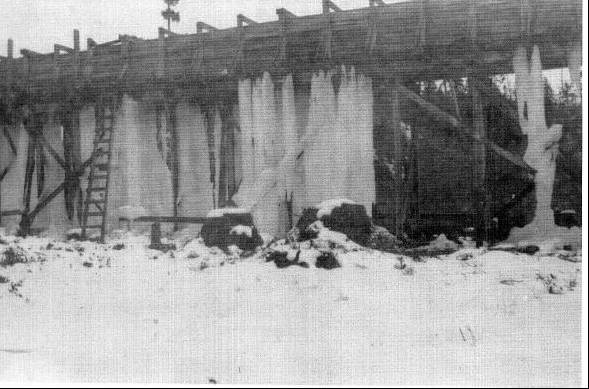 All labor and much of the lumber for flumes had been furnished by the government; yet in 1938 it had been forced to borrow more money from the state. The indebtedness in that year had been $138,000; and though a definite bond retirement schedule had been set, the schedule was never met. Again in 1946 the state put $81,000 into the company, bringing its indebtedness up to $210,000. The fallacy, Jack Connor pointed out, had been in borrowing money over a period of 40 years to finance repairs which would be worn out in 10 or 15 years. Jack Connor was a recent arrival in Yelm, an employee of Puget Sound Power and Light Co. He had great hope for Yelm’s future, and as director of the irrigation company was working confidently to accomplish that hope. “We have a big job,” he said. “We can’t be satisfied with simply replacing broken-down material. It is our policy, when flumes break down, to replace them with permanent ditches. We’ve got to get the water to the prairie, and we’ve got to supply an adequate, permanent distribution system. When we have restored the farmers’ confidence, then and only then will the project accomplish its initial purpose. The cost of construction will be high, but when it is completed, maintenance will be reduced considerably. There were many who claimed that the land was not worth irrigating. They pointed to the rock piles lining the fields in which new rocks worked up yearly – rocks which ranged form the size of a man’s head to the size of a man. But old timers pooh-poohed any mention of Yelm’s soil being unproductive. They recalled the peak years, before depression, when more than 900 tons of blackcaps were produced on the prairie, when beans grew like mad out of the rocky ground. They pointed to Tony Alongi who, during the war years when practically everyone else went to work in some war plant, stayed home and farmed. Tony and his boys could grow anything – onions as big as your head, squash, everything. Why Tony made better than $2,000 from less than an acre of blackcaps during the field’s first year in production. You gotta to fertilize lika hell!” Tony said. The soil scientists of the Department of Interior agreed with Tony. The soil, they reported, was third class, porous in nature and subject to leaching. The 30 or 40 inches of rain which fell each year seeped through the soil carrying the elements and minerals necessary to plant growth. Nor did Robert McKay, Thurston County agricultural agent, offer encouragement to those who would keep the irrigation district alive. In a speech before the Lions Club, he warned that irrigation by means of ditches and flooding was not only wasteful of precious water, it also increased the danger of leaching. Yelm’s hope for prosperity lay in the dairy or poultry industry, not in small farming. Permanent pastures, he pointed out, would last10 or 15 years, would form a thick carpet of sod to protect the soil, fertility would be returned in the form of manure; but, he advised, nitrogen and phosphate would have to be added constantly, preferably by means of sprinkler systems, by which the amounts of water could be controlled accurately. Most of the residents of the prairie were crowded into the high school auditorium that evening when the directors of the irrigation company reported its demise. The king was dead! A few tears were shed as neighbors recalled the times they had labored shoulder to shoulder to bring water to the land. For most it was time of rejoicing. Industry would be brought in. New homes would be built. Land values would soar. It was the beginning of a new era. Long live the King! The old timers though were pooh-poohing any mention of Yelm’s soil being unproductive and recalling the years before the depression when blackcap berries covered the prairie, and beans grew like mad out of the rocky ground; and Jack Conner, the director of the irrigation company, was looking forward to restoring all that prosperity. And all the time the arguments were going on, folks were getting hotter and hotter under their collars, and the numbers of acres receiving water was getting less and less until, in 1950, the District discontinued operations altogether. After another year the mess was straightened out. Folks got back to loving one another, and it was possible once more to get a clear title to prairie land and banks started lending money again to Yelm folks. 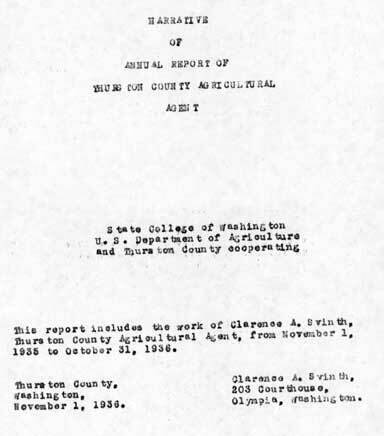 Introduction: Edgar Prescott, a teacher at Yelm High School and a resident of the town, summarized the impact of the irrigation saga in the following section of his memoir on file at the Washington State Historical Society. But we were thinking more in terms of a house that was sitting up on a solid foundation, one that hadn’t had termites eating on it for years and that had a green lawn around it and beds to plant flowers. There were houses like that in town. And it wasn’t that we couldn’t afford to buy a house. The four or five thousand dollars we were making between us had probably about as much buying power back then as the sixty thousand or so a pair of teachers like us would be subsisting on today. The problem was that there wasn’t a bank in the country anymore that would lend money, not to us or to anybody else for the purpose of buying Yelm property. Right there in town in 1948, among all those wonderful people, there was going on what you might call a bloodless, up till then anyway, civil war, and it was all on account of the Yelm Irrigation Company that I told you about a few pages back. For all it had been such a heroic accomplishment, there were a lot of folks claiming that irrigation had retarded the town’s growth, and was leading to its ruination. 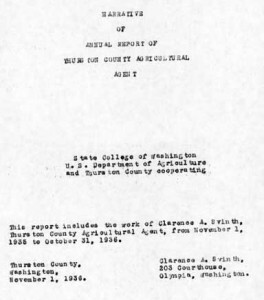 According to the figures they were throwing around back then four hundred and thirty nine acres, ten per cent of all the first class land, had already been taken over by the irrigation district for non payment of assessments, which were ten dollars an acre for irrigable land, and one dollar and a half for non irrigable land, and which you were expected to pay whether you got water or not. Of the four thousand three hundred acres in the district suited to irrigation, they claimed, no more than thirty per cent was being farmed. The flumes were shot, the ditches were leaking, the district was dose to three hundred thousand dollars in debt, no new families were moving in because there wasn’t an acre on the prairie that the irrigation district didn’t have a lien on, and there wasn’t a bank in the world that would lend a dollar to buy with, and what was more, the damned land wasn’t worth farming in the first place because there wasn’t an acre on the prairie that the irrigation district didn’t have a lien on, and there wasn’t a bank in the world that would lend a dollar to buy with. But in spite of the rocks, at least until the war got going, a lot of folks on the prairie had persisted in farming. Clear back in 1910, Mr. Schneider told me about it a bunch of citizens had got together and started work on a ditch that would bring irrigation water from the Nisqually River to the prairie. They had got the job done too, even though it took a good six years to complete. They still pointed back to a peak year in the twenties when more than nine hundred tons of blackcaps had been harvested. They bragged that beans grew like mad in the rocky soil, and pointed to Tony Alongi. When practically everyone else had gone to work in some war plant in Tacoma or Seattle, he had stayed home and farmed. Tony could grow anything – onions as big as your head, squash. Why Tony had made better than two thousand dollars from less than an acre of black caps just this last summer. But mostly now the high priced water was draining away from rocky ditches and worn out flumes, heavy wooden canals supported on framework trestle’s, like old-fashioned railroad bridges. They crossed and recrossed the roads, spilling small waterfalls on the asphalt below and drenching all the cars that passed under them.